Pros and Cons of Purchasing a Prefab Guard House | BIG Enterprises Inc. Serving to protect a facility and the people and property inside, a prefab guard house offers tremendous value. With the need for enhanced security for businesses, military bases, airports, government buildings, a portable guard booth on-site has become commonplace. When considering buying a pre-manufactured booth, it is important to understand both pros and cons. As mentioned, a portable guard booth is used as an enhanced safety measure. When placed on the outside of a facility, the individual manning the booth has far better control and knowledge of who enters and exits. In countless situations, a guard shack has deterred criminal activity. Being a prefabricated product, the booth is built in a factory and then shipped to the installing site, which dramatically reduces time to build a booth on-site..
Prefabricated guard shacks can be ordered as standard or customized products. In either case, special upgrades can be made based on the customer’s requirements. Examples include blast-resistant and bulletproofing features, air conditioning and heating, security lighting, advanced technology, restrooms, and much more. Because a prefabricated guard shack is constructed in a factory as opposed to being built on-site, it is more cost-effective. A portable guard shack can be disassembled, relocated, and reassembled quickly and easily. From an environmental perspective, there is less material waste with prefab shacks. 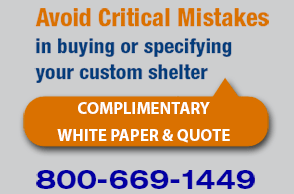 If a pre-manufactured booth does not come from a reputable company, there is a risk of error. Even one small mistake can lead to a significant problem at some point in the future. Some companies that manufacture prefab booths have limited design options, meaning that no detail or personality is incorporated into the finished product. Clearly, there are far more advantages of purchasing a prefabricated guard shack than there are disadvantages. With better security being a top priority for everyone, the popularity of guard shacks has skyrocketed. Typically, a guard shack is placed outside of a fenced-in area where it serves to maintain control of traffic going into and out of a facility. Although you can choose a kiosk booth where employees and outsiders check themselves in and out, most prefer a booth that is manned by one or more individuals. At B.I.G. Enterprises, we take security and protection seriously, which is evident in all of our products. If you are interested in having a guardhouse manufactured, we can help. Security shacks for rent are not available from us. Please visit our website to learn more about our company and what we do. If preferred, you can call us to speak with a team expert.